This gene is a member of the H/ACA snoRNPs (small nucleolar ribonucleoproteins) gene family. snoRNPs are involved in various aspects of rR processing and modification and have been classified into two families: C/D and H/ACA. The H/ACA snoRNPs also include the NOLA1, 2 and 3 proteins. The protein encoded by this gene and the three NOLA proteins localize to the dense fibrillar components of nucleoli and to coiled (Cajal) bodies in the nucleus. Both 18S rR production and rR pseudouridylation are impaired if any one of the four proteins is depleted. These four H/ACA snoRNP proteins are also components of the telomerase complex. The protein encoded by this gene is related to the Saccharomyces cerevisiae Cbf5p and Drosophila melanogaster Nop60B proteins. The gene lies in a tail-to-tail orientation with the palmitoylated erythrocyte membrane protein gene and is transcribed in a telomere to centromere direction. Both nucleotide substitutions and single trinucleotide repeat polymorphisms have been found in this gene. 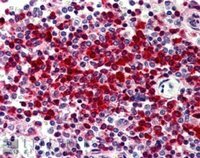 Mutations in this gene cause X-linked dyskeratosis congenita, a disease resulting in reticulate skin pigmentation, mucosal leukoplakia, il dystrophy, and progressive bone marrow failure in most cases. Mutations in this gene also cause Hoyeraal-Hreidarsson syndrome, which is a more severe form of dyskeratosis congenita. Two transcript variants encoding different isoforms have been found for this gene. Yoon A, Peng G, Brandenburger Y, Zollo O, Xu W, Rego E, Ruggero D.
Impaired control of IRES-mediated translation in X-linked dyskeratosis congenita. Science. 2006 May 12;312(5775):902-6. Erratum in: Science. 2006 Sep;313(5791):1238. Brandenburg, Yves . 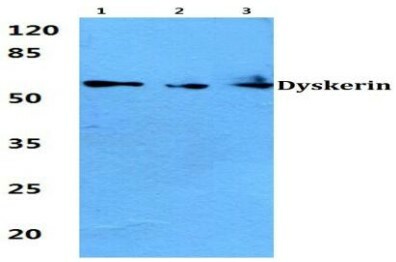 Western Blot analysis of DKC1 expression in transfected 293T cell line (H00001736-T01) by DKC1 MaxPab polyclonal antibody.Lane 1: DKC1 transfected lysate(56.54 KDa).Lane 2: Non-transfected lysate. DKC1 MaxPab polyclonal antibody. 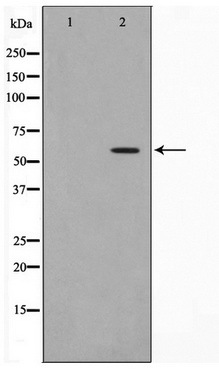 Western Blot analysis of DKC1 expression in A-431. 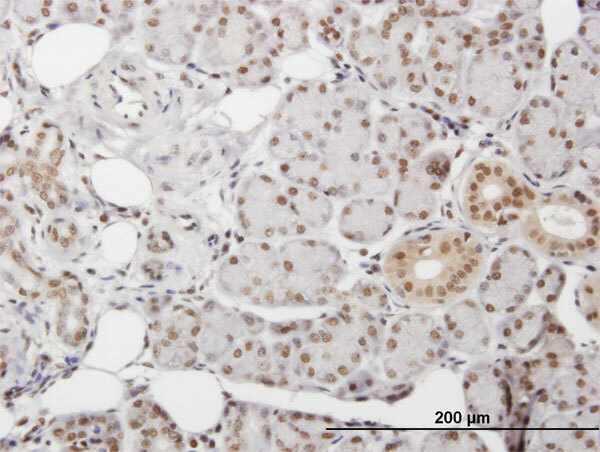 AP08575PU-N at 5 µg/ml staining DKC1 in Formalin-Fixed Paraffin-Embedded Human Spleen tissue by Immunohistochemistry. 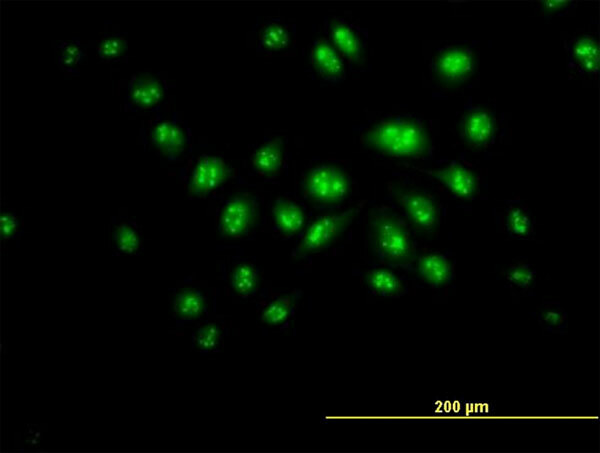 Immunofluorescence analysis of HeLa cells, using Dyskerin Antibody. The picture on the right is treated with the synthesized peptide. 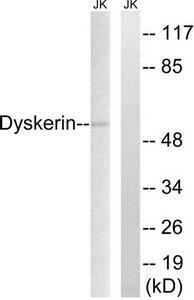 Western blot analysis of extracts from JurKat cells, using Dyskerin Antibody. The lane on the right is treated with the synthesized peptide. TA305629 (5ug/ml) staining of paraffin embedded Human Spleen. Steamed antigen retrieval with citrate buffer pH 6, AP-staining. Western blot analysis of extracts from HeLa cells, using Dyskerin antibody.The lane on the right is treated with the synthesized peptide. 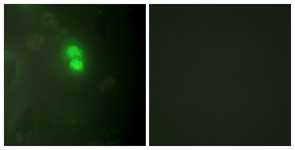 Immunofluorescence analysis of HeLa cells, using Dyskerin antibody.The picture on the right is treated with the synthesized peptide. DKC1 Antibody (Center) (Cat.#TA324811) western blot analysis in mouse testis tissue lysates (35ug/lane).This demonstrates the DKC1 antibody detected DKC1 protein (arrow). DKC1 Antibody (Center) (Cat. 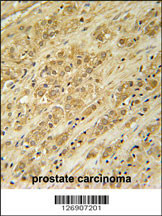 #TA324811) immunohistochemistry analysis in formalin fixed and paraffin embedded human prostate carcinoma followed by peroxidase conjugation of the secondary antibody and DAB staining. 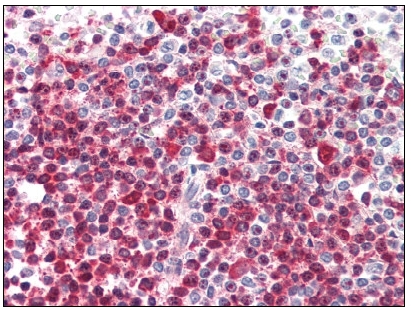 This data demonstrates the use of the DKC1 Antibody (Center) for immunohistochemistry. Clinical relevance has not been evaluated. 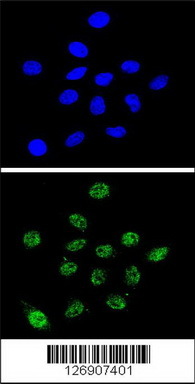 Confocal immunofluorescent analysis of DKC1 Antibody (Center)(Cat. #TA324811) with 293 cell followed by Alexa FluorÂ® 488-conjugated goat anti-rabbit lgG (green). DAPI was used to stain the cell nuclear (blue). 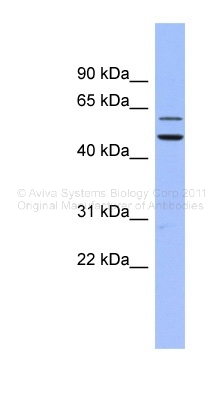 Western blot analysis of extracts of various cell lines, using DKC1 antibody. 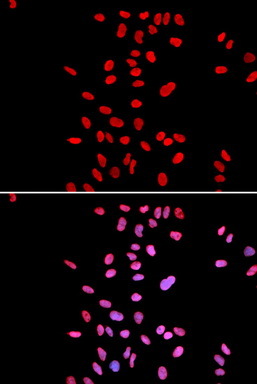 Immunofluorescence analysis of U2OS cell using DKC1 antibody. Blue: DAPI for nuclear staining.